Last week I made an Onion Wrap and it was delicious. This time, I wanted to experiment with the recipe. Getting just the right thickness is a little tricky, but they really are pretty easy to throw together. These are very similar to the Onion Wrap, however, I added 1 cup of veggie pulp from juicing (carrots, celery, kale, dandelion, apple, cucumber, etc). I also cut down on the onion a bit, and added a couple of teaspoons of caraway seeds to the batter, which gives this recipe a lovely "rye" bread taste that W and I both adore.. 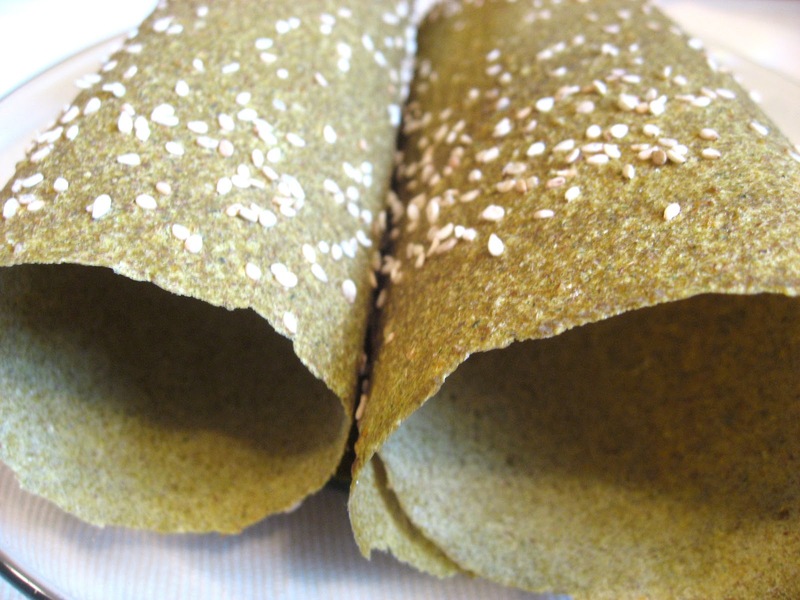 When spreading the mixture onto the dehydrator sheets, garnish with sesame seeds, herbes de province, or sdill. You could use any variety of dried herbs and combination any combination of veggies that make your pulp. It will change the flavor, so see use your favorite juices to get the best tasting pulp. If you don't have Quinoa flour and don't feel like grinding it, try using almond flour or almond pulp. I don't think it would make that big of a difference. I also added a date or two to the mix to add a bit of sweetness. I'd like to experiment with different flours, nuts and seeds. I might add some coconut meat to this recipe as well. See ORIGINAL Recipe HERE. 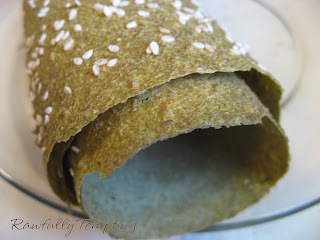 Get creative and create your OWN version of this wrap bread. I will definitely be giving this a try. Thanks for the inspiration! Am going to give this a whirl. how thivk would you say you are spreading the "batter" like 1/4"? These are pretty thin..take a look at photos above. They were more like 1/8". Always good to save a bit of batter in case you end up with tears or holes..and you can patch them. haha ..please let me know how they turn out..love to hear.